The best way to invest and establish a Software or IT Company in Thailand, is to check at first if you are eligible to register it under BOI Thailand (Board of Investment Thailand). Compass Softwares (Thailand) Ltd is registered under BOI, and as a local Software company we understand the true needs and the process to register an IT company with BOI Thailand. BOI Thailand encourages foreigners to invest in specific activities especially in IT and Software industry, and there are many Thailand BOI privileges for those who have investments in Thailand. FREE of charge you can contact us to get our professional advice whether your business activities qualify for BOI privileges. We will also advise you for tax and legal privileges that are granted to approved BOI applicants. 1st step: Apply to obtain BOI Thailand promotion privileges and benefits Compass Softwares will prepare an application form for the promotion certificate, then fill out and send to the Thailand BOI Office together with other documents required by Thailand BOI. This process will take approximately 4 days. 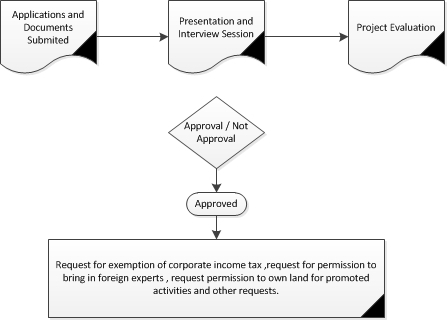 Within 10 days, you will have to make a presentation to the Thailand BOI in regards to your business plan. Our staff will accompany you to the meeting with the Thailand BOI. Once the application has been approved, you will receive an investment promotion certificate within 60 days. The promoted company must follow the conditions laid out in the Certificate. 2nd step: Thailand Company Registration When you get a notification of approval, we will then assist you to set up a Thai company. After registration is complete, Compass Softwares will register the company's TAX ID card and VAT certificate, then submit them to the Central Filing Office of the Revenue Department.